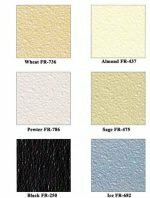 There are numerous color charts for toilet partitions to be used in every school, workplace, and private business including General Baked Enamel, General Baked Enamel Textured Colors, General FRP, and General Solid Plastic Colors. Centar has numerous Toilet Partitions available including floor supported, headrail braced, and floor to ceiling toilet partitions. Please call our product experts to determine all of your options including colors to match your school colors, branding, or custom decor. (800) 843-7878.